Crazy occurrences happen at fast-food restaurants, no doubt. 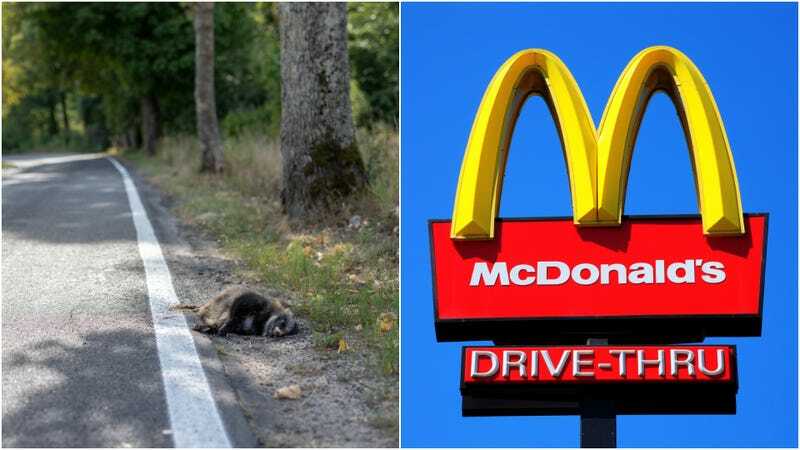 But this one feels new even to our jaded eyes: An elderly man brought a dead raccoon inside a McDonald’s in San Francisco and placed it on a table, closing the location for hours. ABC-7 reports The Department Of Environmental Health says the McDonald’s was temporarily shuttered for five hours to disinfect the dining room. The video was recorded by another McDonald’s patron, who narrates the footage with appropriate horror and disbelief. “I’ll tell you. Only in San Francisco,” he exclaims. Police officers who responded to the McDonald’s reportedly questioned the man who brought the raccoon in, but released him after it was determined he did not need to be detained. Animal control then removed the animal from the premises.